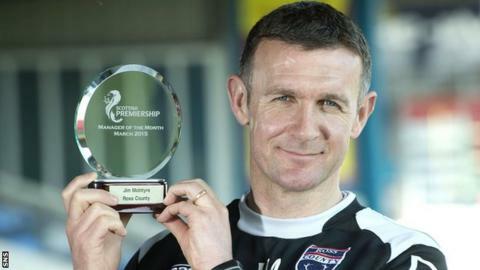 Ross County boss Jim McIntyre has won the Scottish Premiership manager of the month award for March. McIntyre, who also won the February award, has led his side to an eight-match unbeaten run. County picked up seven points from their three games last month, including wins over Partick Thistle and Kilmarnock. "We're doing a lot of things well but there's still a long way to go," McIntyre told BBC Scotland. The Highlanders, who moved off bottom during their unbeaten run, visit basement side St Mirren on Monday as they bid to avoid relegation. And McIntyre credited his side's run of form on having a settled side. "Picking the same first eleven helps," he said. "We're also scoring the first goal in a lot of matches which is an important stat, you do go on to win a lot of your matches when you get that first important goal. "I think the players are in a good place psychologically, but I don't think that's going to have any great bearing on the games in the split, it's about who handles the pressure best. "For a long time it was classed as St Mirren, Motherwell and Ross County, that two out of three were going to be relegated. I think we can safely say that's not the case now, there's one or two teams above us who are going to have to win matches as well. "I think we've got a good team. I think we've got a good group of players who are capable of winning matches which they've proven over the last wee while. "But, we've got to make sure we continue to do the ugly side of the game which we've done very well and keep trying to out work your opponents."